Laguna Beach Pool Deck Resurfacing. Picture yourself lazing about on a warm summer day. You go in and out of blessed sleep as the sun beams down on your whole body. The playful splash of the pool fades into the background. The more distant hum of the Pacific Ocean all but disappears as you sink into your pool side lounge chair. If only all of your holidays in Laguna Beach could be this relaxing. 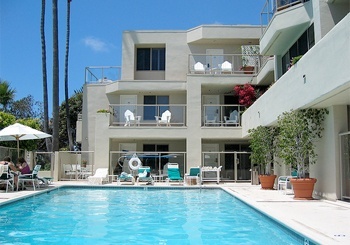 They can be…at the Inn at Laguna Beach in Orange County Ca. Prestige Deck Coating knows this very well, we redesigned their pool deck surface just in time for the summer. The Inn at Laguna Beach attracts high end tourists and clients. This is why they hired Prestige Deck Coating to install a concrete overlay around the perimeter of their pool deck. The beauty of the ocean and town of Laguna Beach does not complete the picture though. Safety is the number one priority during the busy and wet summer months pool side! With all of the wear and tear that can happen to a tourist haven like the Inn at Laguna Beach, their pool deck needed at a fresh look. Prestige had just the answer with our multi-texture options for decorative concrete solutions. Our plan was to apply a textured overlay across the existing perimeter of the concrete pool deck to add some snazz and grip. If there are any cracks, we use a crack chaser on a grinder. We cut a V into the cracks and pour epoxy filler to prepare the surface for our first concrete layer. Prestige Deck Coating is your Laguna Beach pool deck resurfacing experts! We offer a number of deck waterproofing systems and warranties based on your specific service needs. With Prestige, you can welcome the summer heat and stay cool in your pool and on your new pool deck surface. Check Out Our Deck Waterproofing Services!